Enlighten Financial | Where are the losses? Financial institutions are currently in the midst of a prolonged expansionary cycle. The economic environment has provided the opportunity for loan portfolios to be in a relative position of health. Most financial institutions are profitable and are continuing to grow the balance sheet. Earnings have improved as loss provisions are nominal. 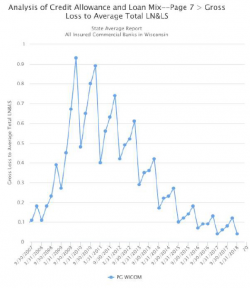 FDIC insured institutions in the state of Wisconsin experienced a .04% gross loan loss rate (Figure 1) of total loans in the first quarter of 2018. This level was matched in the first quarter of 2017 and had not matched for more than 17 years. Total loans and leases 90 days past-due (.01%) and total loans and leases 30-89 days past-due are at historically low levels (.79%). Over the past nine years, we have seen the loan portfolio for the FDIC insured institutions in the state of Wisconsin decrease from $70.8 billion as of December 31, 2009 to $63.8 billion (-8.9%) as of March 31, 2013 and grow again to $70.1 billion (9.8%) as of March 31, 2018. During the period from March 31, 2013 to March 31, 2018, allowance for loan and lease losses declined from their high point of 1.93% to 1.35% of total loans and leases not held for sale, a 58-basis point decrease. Provisions have remained relatively consistent against average assets at .06% since the first quarter of 2015. This inversion of portfolio growth to declining allowance levels is additional reflection of current bankers’ views of strength in the economy. The ag sector of many portfolios is feeling a certain degree of stress. Losses spiked up by 20 basis points during the first quarter of 2018 to .23% of agricultural loans. Loans to finance agricultural production and agricultural farmland have experienced a recent increase in loans 30-89 days past-due and loans greater than 90 days past-due. This current agricultural stress is unfortunate and is due to larger issues with production, pricing and trade. The agricultural sector is the relatively obvious stress at this time in the portfolio. Are losses building in the portfolio along with growth in the loan portfolio? Is the prolonged expansionary cycle beginning to push weaker structures or more competitive deals as institutions continue to demand growth in the loan portfolio? Although the total portfolio of FDIC insured institutions in Wisconsin has grown 9.8% since March of 2013, the total commercial real estate portfolio has only grown by 4.9%. In that same period non-owner-occupied commercial real estate loans have grown by 18.5% to $24.4 billion (Figure 2). The composition of the total commercial real estate portfolio has changed with non-owner-occupied growing from 52.6% of total commercial real estate loans to 59.5% of total commercial real estate loans. Delinquencies and charge-offs remain benign across all categories of commercial real estate. 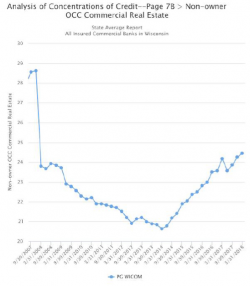 The March 31, 2018 State Average Report for Wisconsin from the FFIEC does not present any immediate signs of stress related to credit quality in the commercial real estate portfolio. Time will tell where the losses reside in the loan portfolios, but they are there. Loans may be making little noise at this time based on the measured metrics. Factors that will impact portfolio stress and loss rates include extended amortizations, less restrictive loan terms, lower debt service coverage requirements at initiation, loan to value and other structural exceptions, and monitoring exceptions. These underwriting and approval factors may be material in some cases to winning or retaining a deal; however, a weakening of these factors to approve deals will certainly impact the extent of problem loans in the future. Enlighten Financial is a specialized consulting firm that focuses on loan review and risk management services to community banks and credit unions. Enlighten Financial has made it our business to shed light on the complex financial landscape, and lead clients in the right direction. We work with financial institutions and other providers to mitigate risk. To talk to us directly, please call: (920) 445-8881.